The Prize-Giving Ceremony of the HK-EU School e-Learning Project “Green Living and Sustainability in the Community” was successfully held on Thursday 20th October at the Hong Kong Baptist University (HKBU). This ceremony celebrated the end of an eight-week-long pilot e-Learning project, which brought secondary school students from Hong Kong and European cities together to create new ideas contributing towards a more sustainable community. Six awards were handed out to winners by Prof. Vivian Taam Wong, Chairperson of Friends of the Earth Hong Kong, Dr. William Yu, CEO of World Green Organisation, together with Prof. H. Werner Hess, Deputy Director of the European Union Academic Programme Hong Kong and Dr. Tushar Chaudhuri, Programme Coordinator of the European Studies Programme of the HKBU. The ceremony was officiated by Dr. Albert Chau, Vice-President of Hong Kong Baptist University (Teaching and Learning). Dr. Chau was pleased to see the outstanding performance of the students in the project. He emphasized the importance of internationalization and sustainable development to the youth. A panel consisting of five judges from four local NGOs was invited to make the final decision on the most successful overall Group Community Project in terms of ideas, implementation and cooperation, which was awarded the grand prize, the “Best Sustainable Community Project”. The winner of this grand prize saw a successful collaboration of Group 22 between three Hong Kong students from S.K.H. Lam Woo Memorial Secondary School, and two students from Gymnasium Oberalster of Hamburg, Germany. Through their observation in daily life, the Hong Kong students found out that a huge amount of plastic wrapping and packaging for food was wasted in wet markets, supermarkets or tuck shops in Hong Kong. In contrast, group members from Hamburg revealed that some sellers in Hamburg encouraged non-plastic packaging, for example, using paper to wrap meat. The group suggested that Hong Kong can promote the usage of non-plastic packaging which is actually welcomed by shops in wet markets. The judges found the winning project well researched and documented with a clear video. With the generous support from the Hong Kong Economic and Trade Office in Brussels and the Hong Kong Economic and Trade Office in Berlin, the winners will go for a one-week field trip to their partners’ country where the students will visit their partner school, as well as green facilities and projects in the city. The students will become “sustainability ambassadors”, and continue the exchanges and dialogues of green living and sustainability in person in both Hamburg and Hong Kong. This e-Learning project was jointly organized by the European Union Academic Programme Hong Kong (EUAP) and the European Studies Programme of the HKBU. Seven Hong Kong schools and six schools from six cities across three countries in Europe (Germany, the Netherlands, and Spain) took part in this project. Between March and June 2016, the project connected over 100 students across communities by way of exchanging ideas, and collaborating through research on topics such as “Plastics & Recycling”, “Fashion: Labour & Toxic Issues”, “City: Urban Life & Green City” and “Food: Production & Consumption”, thus heightening their awareness of sustainability. 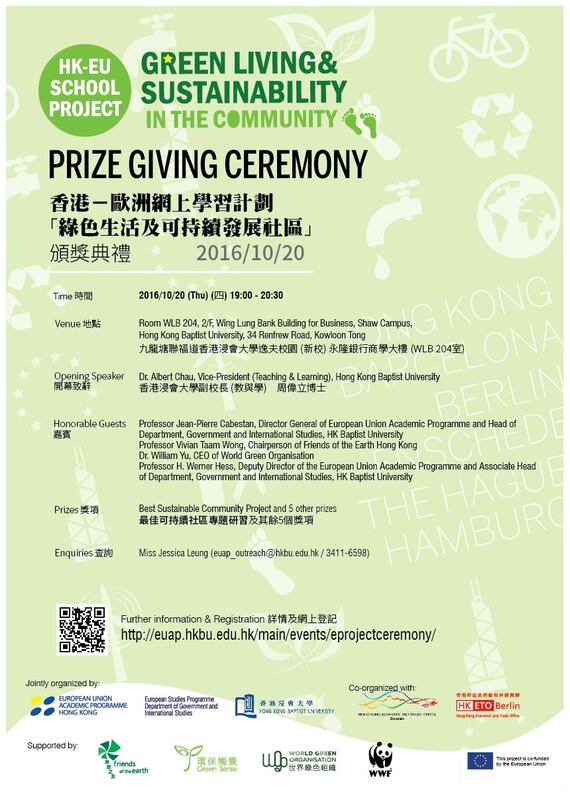 For more details of the Ceremony and the e-Learning Project, please visit the official website at http://euap.hkbu.edu.hk/youngeurope/.